VSSVC.exe Microsoft® Volume Shadow Copy Service -used for backup. If this process will be stopped, no back up at that moment. Also, if this service turns off, everything that depends on it will not run. The process does not normally consume a lot resources, but if you are experiencing problems with full CPU or memory usage of the vssvc.exe process, then you can try to turn off it. The first thing you should do is to find the location of the file vssvc.exe. If it is found in the System32 folder, and its settings indicate that it is normal file and it is Microsoft’s native process. 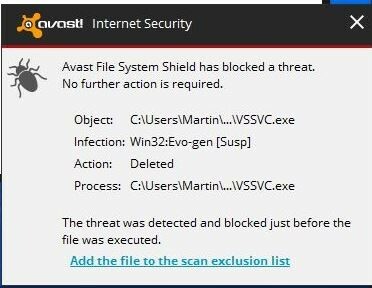 But if you find this process in a different folder, in all cases you should delete that file because this is virus. How to restart the process? Microsoft Volume Shadow Copy Service (VSSVC.exe) does not normally consume a lot of resources, but if you are experiencing problems with full CPU or memory usage of the vssvc.exe process, then you can try to turn it off manually. Try to stop system recovery and see if this reduces the computer’s boot. Move to Control Panel > System > System Protection. Write, services.msc in the “Start Search” field and press “Enter” to open the Windows Service Manager. Find the Volume Shadow Copy service, and then double-click to open the Properties window. Disable the process, and then start it one more time. Or just right-click it and select Restart. Select this volume (%1) if it is a critical volume.Critical volumes are those which ASR must restore.